I did housework most of the week last week so I could spend the weekend sewing. It's paid off because I finished two Christmas pillows. I made this pillow with beautiful fabrics from my stash. The red and green are Liberty Tana Lawns that I bought from Polka Dot Tea in Australia. The gorgeous white linen was a gift that I won on a Sew Mama Sew giveaway day from Lizzie at Swedish Scrapper . This pillow is for my own house. The fabrics are Christmas colours but they are not Christmas fabrics so I can keep this pillow out year round if I like. This pillow measures 15 inches square. I thought I might use this linen for tea towels but I could not bear the thought of it being stained or eventually full of holes. (I don't know what my husband does but our tea towels wind up holey after a while. Something to do with drying the knives I think!) I also have a piece of linen prepped for some Christmas embroidery that I hope to be able to work on this week. This pillow is a gift for my kids' piano teacher. I used the Liberty tana lawns again and the music print is Aspen Frost by Basic Grey for Moda which I bought from Sew Me A Song . The black binding fabric also has music notes and symbols. I bought it in the same online shop but I don't have selvage information on it. Here is a closer shot of the fabrics and quilting. I used Aurifil 50 weight thread throughout both these projects. This music pillow has white for the quilting. Red for outline quilting and black thread for the binding. To bind a pillow you just sew the pillow back on (I used a simple envelope back where the two pieces overlap and are hemmed at the edges that meet in the middle), trim up the outside edges to be even with the pillow front and then bind just like binding a quilt. I am so grateful to my husband for taking care of the kids while I got these sewn. That's one Christmas gift checked off the list and one beautiful home decor item for our home finished too. 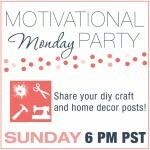 I'm linking up with Motivational Monday Party.